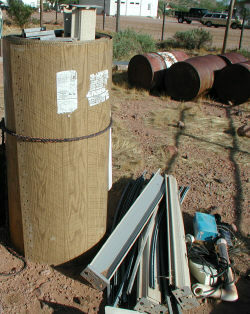 We are going to look at an above ground pool we found on Craigslist. 15 x 30 $325, in Prior Lake, MN. Do you think this is a fair price? What should we look for? Hi Janet. It looks like an Asahi pool, you can read more about them here. The price seems fair enough. Based on the photos of the pool and my knowledge of the brand you will probably not have any rust issues. Digging up some dirt around the outside of the pool will let you know real fast how the bottom six inches of the wall looks and the condition of the bottom rails. The photo shows the sidewall a little wavy, I would check that out. Asahi pools have very thin walls so you want to make sure it is still in good shape. Be aware also that a new liner will be needed. As soon as the water is out of the pool the liner will shrink and is not worth trying to re-install. The right column has a pool store link where liners are reasonably priced. 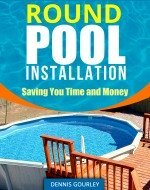 Here are a few more pages about used above ground pools and oval pool installation. We have found an above ground pool that is two years old. The current seller of the pool bought the pool from a co-worker. After buying, he never set the pool up. He has stored all of it in his basement except for the wall of the pool. The walls are stored under a deck. Hi Tyson. Without seeing the pool, or a photo of it, I will have to generalize just a little. Basically, you are buying a pool that should be in as close to new condition as possible. Using this handy tool found at Blue Haven Pools I have built a very basic pool package starting with the least expensive pool on the list. The most expensive is about $3,500, you can see there is a wide range in price for the first figure. The rest of the numbers are basic equipment at very reasonable prices. Depending on what the package includes, the value new should be at least two grand. Buying that for six hundred sounds like a great deal to me. Actually it would have to be the worst pool made, matched with lousy equipment, to not be a good deal. If it is in fact bottom of the line everything, it could easily wind up being far more trouble than it is worth. Assuming it is a quality pool, with good equipment, I would offer to split the cost of the new liner with him and try to get it for 500. Before you pay, be sure to drag out all of the parts and count them. Make sure everything is there. This is pretty easy to do, make sure you have the same number of all your basic parts. If you have 17 bottom rails you should have 17 top rails, 17 uprights and so on. More about buying a used above ground pool can be found on these pages. I have a 24 foot by 54 inch round above ground swimming pool which is two years old. It comes with everything and also has an alarm for security purposes. Do you know of anyone who wants to purchase it? Either a store or a person would be fine. I can be contacted at ssmallslee@hvc.rr.com anytime. I will also submit photos of the item if anyone's interested. Hi Sandra. I will add a few comments about selling an above ground pool. This time of year, when the kids are heading back to school, is the best time to buy an above ground pool, but not really the best time to sell one. Anyone that can wait until late in the season to get their pool can usually find some good deals. If anyone is even thinking about a pool for next year, now is the time to buy. Hopefully you can find a late season shopper and sell your pool, or hang on to it over the winter and sell it in the spring for more money. Pools always sell better when they are full of crystal clear water with everything working properly. A pool in this condition will bring more money than a stack of parts in the garage. If you do have to take your pool down be sure to take a ton of photos. Take pictures of it assembled and then of the dismantling process. The two best places to advertise your pool for sale are your local newspaper and Craigs List. You might also post fliers at stores or anyplace with a bulletin board. Used pools are in demand so if you are persistent you may find a buyer for it. Dear Pool Pro, I have recently come across a "brand new, in the box", Zodiac palladium pool at what seems to be a reasonable price. I researched the company and found out they do not make pools anymore. What is your opinion of the quality of the pool as compared to other mfg's and would replacement parts be to hard to come by? Thank you for your time. Hi John. Zodiac is a well respected name and they make a lot of pool products. The pool is probably just fine. I would expect two things from the seller. I would want a good price, since problems down the road might be hard to deal with. I would want to inventory the pool before I paid the money. If there were parts missing, I would pass on the deal. It seems to me if they wanted to sell the pool, they would do so under the condition all the parts were there. If all the parts are there, and if the price is right, buy it. It should be many years down the road before you should even begin to think about needing replacement parts. The parts that usually wear out can be replaced with other brands. Other parts that may get damaged in some way can usually be fabricated. Some friends recently gave us what looks like a pretty good above ground pool, which had been given to them. LOL. So, no instructions and, because it's broken down, I can't seem to find a name or manufacturer. It came with a big blue ball sand filter -- don't know if that means a thing. But, is there any place I should look to see if I can find a serial number or some other clue? I don't even know the dimensions and my friend who gave it to us is deployed. I need a new liner and want to get it up and running for our kids this summer. Hi Sarah. If I could see pictures of it I could probably tell you what it was. Finding the size is pretty easy. You would lay out all the bottom rails and connect them together. You then need to use a center point and make the circle completely round. It your radius winds up being nine foot even then you have an eighteen foot pool. These two pages may be of help also. You could read through my pages and probably find more than enough information to install the pool without any further instructions. Just remember, make the pool perfectly round and perfectly level. Starting with a pile of pool parts is anything but easy. But with enough information I could walk you through anything. Counting the parts is an important start, see what you have and what you might be missing. If you have 14 uprights, 14 top rails, but only 13 top rail plates, you have a missing part.